This species is accepted, and its native range is Kenya to Botswana. Annual; culms erect, 25–120 cm. high, glabrous or with soft deflexed or spreading hairs. Leaf-blades linear-lanceolate, 8–24 cm. long, 6–12 mm. wide, cordate at the base, flat, membranous, often yellowish green on drying, glabrous to pilose, acute to acuminate. 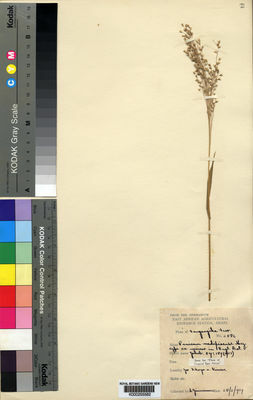 Panicle oblong, 10–20(–30) cm. long, much branched, the branches fine and ascending. Spikelets oblong, 2.5–3.7 mm. long, glabrous, usually pale yellowish green, acute; lower glume broadly ovate, 1/4 the length of the spikelet, cufflike, membranous, 1–sub-7-nerved, acute; upper glume ovate, membranous, 9-nerved, acute; lower lemma ovate with two flaps at the apex, 9-nerved, male, its palea well developed; upper lemma beaked, smooth or minutely scaberulous in the upper half or at the apex only. Swamps and damp areas in wooded grassland or bushland, on clay or sandy soil; 460–1100 m.
Annual. Culms erect; 25-120 cm long. Culm-internodes distally glabrous, or hirsute. Ligule a ciliate membrane. Leaf-blade base cordate. Leaf-blades linear, or lanceolate; 8-24 cm long; 6-12 mm wide; light green. Leaf-blade surface glabrous, or pilose. Leaf-blade apex acute, or acuminate. Inflorescence a panicle. Panicle open; oblong; 10-20(-30) cm long. Panicle branches capillary. Spikelets solitary. Fertile spikelets pedicelled. Spikelets comprising 1 basal sterile florets; 1 fertile florets; without rhachilla extension. Spikelets oblong; dorsally compressed; acute; 2.5-3.7 mm long; falling entire. Glumes dissimilar; reaching apex of florets; thinner than fertile lemma. Lower glume ovate; 0.25 length of spikelet; membranous; without keels; 1-7 -veined. Lower glume apex acute. Upper glume ovate; 1 length of spikelet; membranous; without keels; 9 -veined. Upper glume apex acute. Basal sterile florets male; with palea. Lemma of lower sterile floret similar to upper glume; ovate; 1 length of spikelet; membranous; winged on margins (apically); 9 -veined; acute. Fertile lemma oblong; dorsally compressed; 2.5-3.5 mm long; indurate; pallid; without keel. Lemma surface scaberulous; rough above (tip). Lemma margins involute. Lemma apex apiculate. Palea involute; indurate. Africa: east tropical, southern tropical, and south. Annual with erect culms 25–120 cm. high. Leaf laminae 8–24 cm. long and 6–20 mm. wide, linear-lanceolate, cordate, acute or acuminate. Panicle 10–20(30) cm. long, oblong, finely branched. Spikelets 2.5–3.7 mm. long, oblong, glabrous; inferior glume 1/4 the length of the spikelet, cuff-like, membranous 1-sub-7-nerved; superior glume 9-nerved; inferior lemma 9-nerved, enclosing a male flower, its palea well developed; superior lemma smooth or scaberulous towards the apex. Mez in A. Engler, Botanische Jahrbücher für Systematik, Pflanzengeschichte und Pflanzengeographie 57: 189 (1921).